Under used and the unsung hero’s of many rose gardens are the Rugosa Roses. Repeat flowering, fragrant and tough, disease resistant and one of the few roses that grows well in coastal conditions, so why are they under used ? Probably publicity, and they are a little thorny. Fast growing, they can be used as hedge, however more often they are used a shrub, pruned heavily each year otherwise, you just neglect them. One that rugosa rose that we grow is the well known ‘Sarah Van Fleet’ it has ben around since the 1920’s, a proven performer, pictured right. 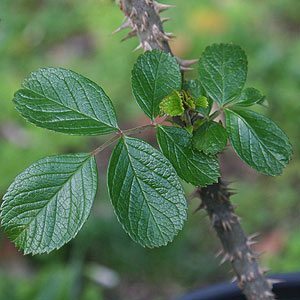 These are a rose that thrive in sun and poor soil, they will do better in a humus rich soil, however Rugosa Roses are real warriors, they will carry on in the harshest climates, they also cope well with cold. So a sunny position, water in well and mulch to provide a cool root run and they will be happy with very little extra care. Pruning depends on what you are after, if its a hedge, let them go and just prune out a few of the older canes after a year or two. Prune to shape as required. Remember that some are taller growing than others, so check with the grower before buying. If you are after a shrub effect, prune hard each year, once established remove one or two of the older canes each year. In terms of disease and pests, you probably will not need to worry. Rugosa alba and Scabrosa are two popular types, however lots more are available. 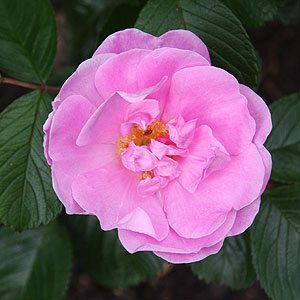 Frau Dagmar Hastrup is well known, a rugosa with nice pink flowers and perhaps a little smaller growing than many. We like Sarah Van Fleet, very fragrant, pink flowers its tall and will get to nearly 2m in height. Souvenir de Philemon Cochet is a double white, a dense growing rose, excellent. Another lovely white flowering rugosa is Blanc Double de Coubert semi double with pretty golden stamens. And for a red, try Parfume de L’Hay, a repeat flowering rose with good perfume. If you are considering using these roses as a hedging plant, remember that some varieties will grow taller than others, so while Frau Dagmar Hastrup might be suited to a low growing hedge, Sarah Van Fleet is a better selection for a taller one. Remember that these are pruned late, and this is because of the wonderful rose hips, most gardeners tend to leave then on the plant right through winter, the bright orange to red hips make a wonderful ongoing display.